Immediately after the House voted to repeal significant portions of Obamacare, the typical media players began proclaiming that this would be a killer for Republican candidates in 2018. They based this, apparently, on poor polling numbers for the initial American Health Care Act and on a belief that Republicans would pay for their vote the way Democrats did for supporting Obamacare. But WPA Intelligence’s models of support for Obamacare and support for replacing it with a market-based solution that lowers costs tell a very different story. 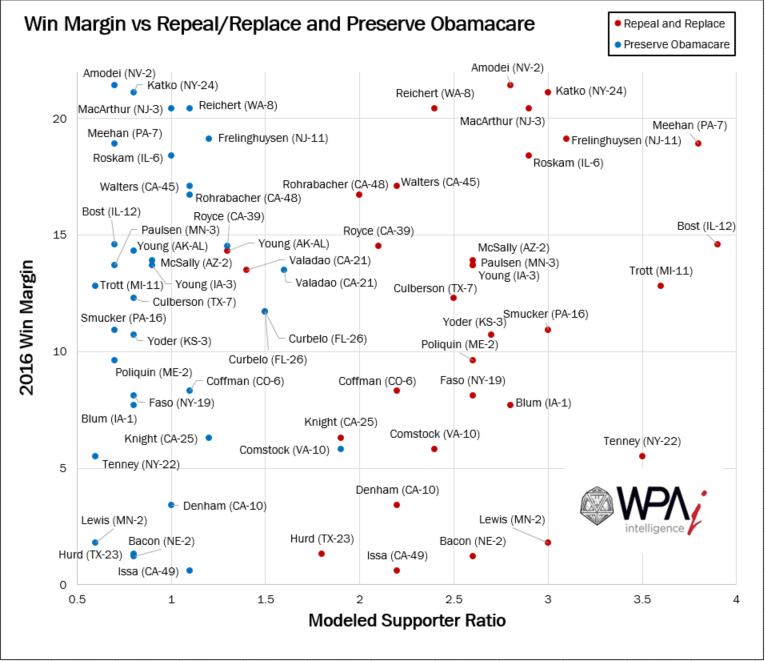 Looking at a potentially leading indicator, like the special election in Georgia’s Sixth District, or at the districts of the most at-risk Republicans who voted “Yea” on the AHCA show little evidence for the media narrative that Americans have a deep affection for Obamacare or that it is preferred over a solution which reduces regulations, cuts taxes, and increases choice. Recent media reports claim that the special election in Georgia’s Sixth District may set a record as the most expensive congressional special election ever. And some have posited that, despite being an open seat, it will be the first test for messaging against Republicans’ efforts to repeal Obamacare. WPAi’s models suggest that this would be an unsuccessful line of attack for Democrats. For every ten Obamacare supporters in Georgia’s Sixth District, there are nine opponents, indicating that there is limited affection for the current system. At the same time, there is overwhelming support for an alternative that repeals and replaces Obamacare, with nearly three supporters for every opponent. 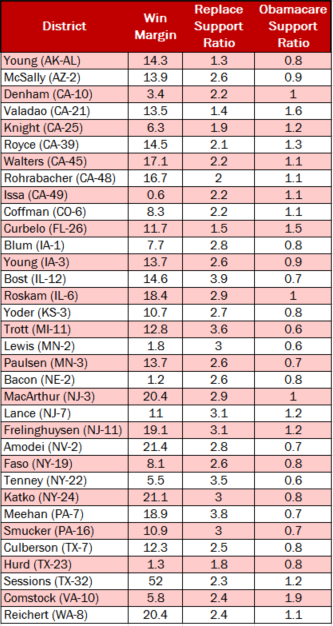 Looking at 25 of the most competitive Republican-held districts in the country again suggests that there is limited damage that this vote will do to Republican candidates. 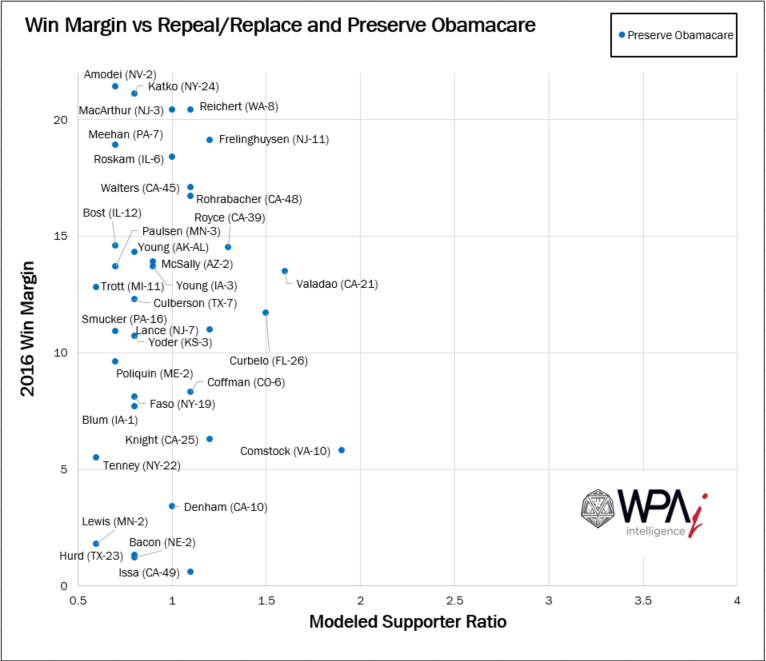 Support for Obamacare only exceeds opposition in twelve of the districts, according to WPAi’s models. And only one of these districts had more Obamacare supporters than did a replacement that reduces regulations, cuts taxes, and increases choice. The following graphs plot two important data points for looking at a Member’s vulnerability in 2018. Along the Y-axis is their margin of victory in the last election. 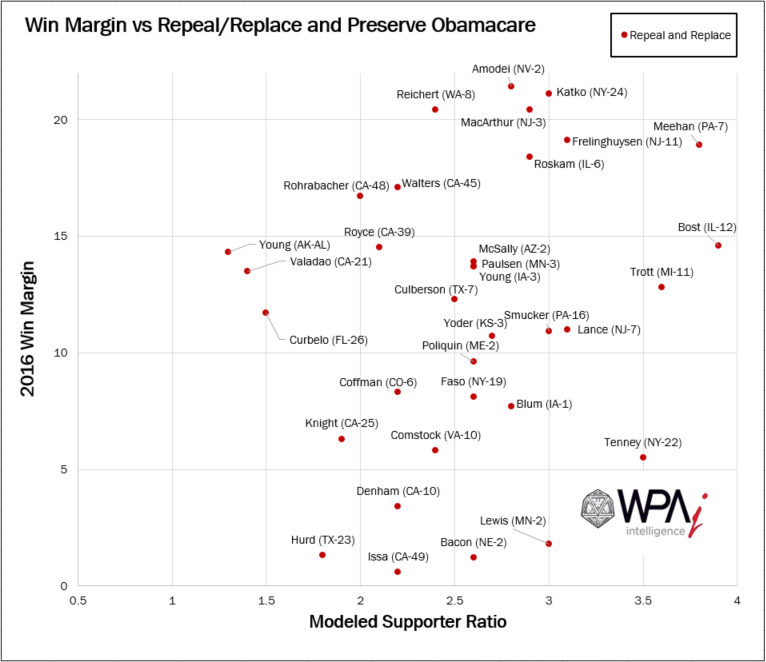 In the first graph, the X-axis represents the ratio of supporters for a market-based approach to repeal and replace Obamacare, a reform closer to what Republicans have campaigned on. The higher and farther to the right a Member is, the safer they are in 2018. This contrast demonstrates that members are on much safer ground supporting a reform like what the House recently passed, rather than doing nothing and keeping Obamacare in place. It should signal to the Senate that making the final reform closer to what Republicans have campaigned on for years — reform that increase competition, offers more choices, reduces regulations — makes it a winning issue rather than a liability. The “Republican Obamacare” narrative is appealing in its simplicity, but our most recent models on the issue suggest that this analogy is simply wrong. At its absolute worst, this vote might be a mild negative for some of the Republican members in highly competitive districts who voted for it. And even that is only likely to be true if a final replacement package does not accomplish what Republicans have promised. While the typical sources focus on coverage, voters care a lot more about their health insurance costs than they do about the total number of people covered by health insurance. If Republicans succeed in lowering health insurance costs by reducing regulations, increasing competition, and giving Americans more choices, then they are more likely to benefit than to suffer from an Obamacare repeal. WPAi Chief Research Officer Bryon Allen, PhD (@AllenWPA), Director of Research Trevor Smith, PhD (@SmithWPAi), SVP Brian Phillips (@RealBPhil), data scientists Jay Lucas (@JayWPAi) and Tim Lee, PhD contributed to this post. Chris Wilson: @TedCruz for President - former Director of Research, Analytics & Digital Strategy, @WPAIntel - CEO. Father to Denver & Carson.